To enroll: Contact AIM at 804-741-2246 or email aim@artsinmotionda.com to sign up! Tuition is charged based on the date of registration, See above chart for registration periods and tuition rates. A $15 non-refundable deposit per camp is due at registration. Remaining balance is due in full by June 20th, 2016. No refunds will be given of the deposit or tuition once paid. Multi-camp discount: Families enrolled in 2 or more 4-day camps will receive a 10% discount on all but one. Camp schedule is subject to change based on enrollment. New this year! Mini camps are 2.5 hours held on one day. 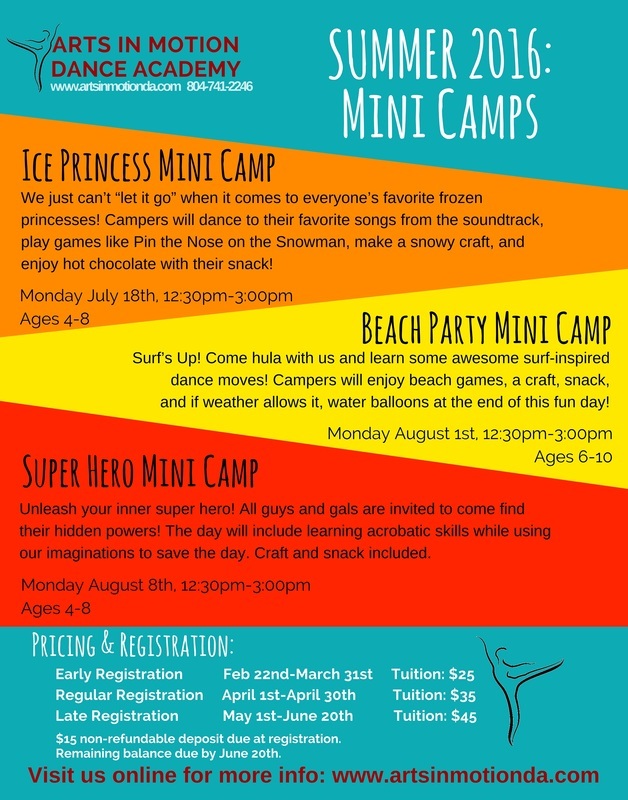 Each camp includes themed activities and dance instruction lead by our professional instructors plus crafts and a snack. We just can’t “let it go” when it comes to everyone’s favorite frozen princesses! Campers will dance to their favorite songs from the soundtrack, play games like Pin the Nose on the Snowman, make a snowy craft, and enjoy hot chocolate with their snack. Surf’s Up! Come hula with us and learn some awesome surf-inspired dance moves! Campers will enjoy beach games, a craft, snack, and if weather allows it, water balloons at the end of this fun day! Unleash your inner super hero! All guys and gals are invited to come find their hidden super powers! The day will include learning acrobatic skills while using our imaginations to save the day. Craft and snack included.